Out on the road, after a time, it’s not so much your own experiences that shape your journeys, as those of others you meet. Every once in a while I intend to take a backseat and let fellow travellers, those I know personally and those I don’t, paint their encounters here. If you were to meet Delhites returning to New Delhi after a sojourn in Mumbai, like I do on the occasions I board the Rajdhani or August Kranti from Mumbai Central for New Delhi, it’s inevitable that you’ll be treated to more than a robust comparison between the two Metros, with New Delhi ‘trumping’ Bombay in all aspects, real and imagined. It’s unlikely they’ll address you directly for that would be rude even for a ‘normal’ Delhite of the mooh phat variety, instead they’ll make certain their conversation is not lost on you, turning to throw a sideways glance every now and then to ascertain that you are indeed tuned in to their litany of woes about your city. And god forbid if they were to detect you squirming; rest assured they’ll raise the intensity by a notch. Given a chance they’d rub oil into a stone. If you can place Meetii Churi in a comparable context, you’ll probably understand what I’m driving at. But I must admit that I quite relish the thread they play out. If anything it shortens the journey even if not the distance. High up in their list, and mind you the list is long, as long as the faces Delhites will pull to get their point across, is the grouse that Mumbai lacks public parks. I’m more than prepared to concede this point. While Mumbai does boast of public parks or gardens as many would refer them, it lacks them in the numbers Delhi totes up. But that’s not the point I’m trying to make. Even if Mumbai were to match New Delhi in the size and number of public parks, I’ve no reason to believe it can ever match New Delhi for the sheer colour of characters one is likely to encounter in the capital city’s green spaces, characters colourful enough to find a place in the park’s flower beds, blooming through lean seasons. And it were two such characters that Sweetie encountered in the course of burning calories in a small neighbourhood park in South Delhi that makes walking in Delhi’s green spaces simultaneously a chore and a delight even if only briefly – one was invisible in the sense his presence was revealed by his association with the garden, and the other, a not inconsiderable Punjabi aunty whose witty repartees lightened Sweetie’s strides weary from pounding the walking paths. While I haven’t seen the neighbourhood park myself, the narration (in italics) and the pictures Sweetie mailed me left me with little doubt that this small patch of green is a labour of love sustained over the years. In poring over the pictures, it soon became evident that while the patch of land probably belonged to the Government, there was little else to indicate it had suffered silently in the shade of indifference, and lacking in inspiration, as is wont to be with public amenities managed by Government agencies. This was probably the work of an individual driven to express himself in the service of his community. 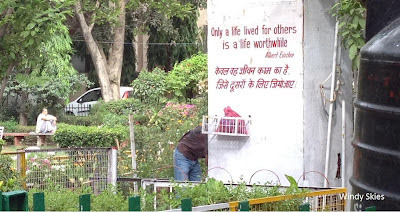 Whoever put up the quote was either inspired by it and volunteered their service to others with the park, or discovered it after being converted to the cause of service to the people. I do not know which of the two was true with Mr. N. P. Thareja when he set up a charitable trust – Human Care Charitable Trust – with like minded people and set out to transform the public park into one the community would pivot around. I was told that Mr. Thareja, a Punjabi, retired as Assistant General Manager with State Bank Of India, is also a practitioner of Palmistry and Astrology, both practices associated more with Brahmins than with enterprising Punjabis who one would expect to say: Believe in the ability of your hands than in the lines that mark them, before setting out to make time count its weight in the money it earns them. Nevertheless there must be something powerfully redeeming in a vocation that seeks to read destinies etched in palms to orient one in the direction of service to fellow humans. And it might not be difficult to fathom why. But that’s a story I’ll leave for another time. In Delhi, and probably in much of India, more so in the north of India, do-gooders come in various forms. There’re those who’ll anoint themselves your subhchintak and offer you their opinion, nee advice, on everything ranging from how to deal with neighbours’ pesky dogs to neighbours who’re dogs, from how to put your daughter-in-law’s mother in her place to why your son-in-law needs to wear better shirts to stop looking like a unwashed rag. Then there’re those subhchintaks, the kind Delhi must necessarily pride in for, these do-gooders will put their money (and sometimes muscle) to use in playing the good Samaritan to their neighbourhood, either as the President of the Resident Welfare Society, a post that’s rarely earned on a platter, or like the elderly Mr. Thareja, who formed a trust and took over the maintenance of the garden in this story, turning it into a place of recreation and inspiration, starting with Albert Einstein’s quote prominently displayed over a water dispenser to quench Delhi’s thirst. All manner of people, mostly the poor and those who cannot afford cold drinking water, step into the garden and drink from the water dispenser. Many fill their water bottles with chilled water and carry them back to their homes. It’s a luxury that’s difficult to come by in Delhi’s summers when the Sun burns hot and taps run dry. They (those who run the park – Human Care Charitable Trust founded by N.P. Thareja) do not compromise on the quality of water just because most of those who use it are the poor. The water is treated by two Aquaguard water purifiers, and together with the water cooler cost the Trust two lakhs to set up. This year, Delhi has been short of water in the summer. Like Ramlila, water shortage visits New Delhi each year, on the dot. And each year, Delhites’ nightmares are relived as they scramble for motorised water tankers. It’s a time the enterprising water carriers will push hand driven water carts into neighbourhood colonies selling water at a rupee per litre, the business lasting so long as the tap runs dry. Everyone is affected by the water shortage, some struggle to meet their own needs for water while some struggle to meet others’ needs. And along Delhi’s streets it’s not uncommon to find rows of earthen water pots and tumblers arranged by charitable souls for passers-by to drink from. Water. The most elemental of the elements. A force of reason, a force for reason. In the moment one drinks water, quietude settles about one, lending the moment open for contemplation and aimless gazing as one gulps down the soothing liquid. It’s a moment no one hurries with if they can help it. It’s a moment receptive to philosophy, to matters beyond the immediate. It’s likely that N.P. Thareja sensed it to be the moment to reinforce the spiritual element lurking, even if in varying degrees, within each human being for, adjoining Albert Einstein’s quote, two Indian sayings in Devanagari script graced the second of the four sides of the towering water cooler. Warna Ta-aat Ke Liye Kuch Kum Na Thay Karu Bayan. Yeh Waha Dhar Hai Jahan Jhukney Se Aabru Nahi Jati. Sweetie added: Mostly elderly Punjabi women come to the park to exercise, atleast that’s the intention but I suspect they’re here more for the company of others their age. No sooner they step into the park in trim walking shoes they look out for familiar faces, and before they break a hint of sweat on their foreheads, the open space fronting Chintan Sthal turns into an impromptu adda with the women settled in plastic chairs arranged in a circle, exchanging news and gossip while sharing prasad from their morning visits to Hindu Temples and Sikh Gurudwaras as appropriate to their beliefs. Motee, motee auntiyan chahey walk karey ya na karey par joothey unkey sab jadataar Adidas ya Reebok ya Nike se kam nahi hothey. Tumharey Bambai ke tarah nahi, jahan auratein Paragon hawai chappal pahankey walk kartee hai. I dodge the barb and duck but smile away. Robust laughter accompanying spirited banter among the women gathered by the Chintan Sthal belies the profound nature of its name, Chintan Sthal – a place for quiet contemplation. On the face of it there’s nothing quiet, and little contemplation if any. However it makes up with much camaraderie. The Chintan Sthal is used by the same Trust that runs the garden to provide basic medical care free of cost to the needy, a service also availed by elderly people from the neighbourhood who step into the park with aches and pains common to their age. I’m told a Physiotherapist is available two days a week to treat just these pains. While companionship beckons, the jamun tree in the park, more so in the Delhi summer when it fruits and colours the park’s walking path, indigo, is too tempting a sight for walkers to turn their backs on. Regular walkers slow down as they approach the jamun tree and pick up stray jamuns lying on the ground while others walk into the park for the fruit. Aside from regular walkers, it’s common to see among others, security guards, the gardener, and stray passers-by who include, maids, drivers and cleaners servicing nearby residential neighbourhoods, take a detour through the park for the jamuns in the summer. They carry back handfuls of jamuns, much of which to savour on their way back home or elsewhere. It’s easy to spot the jamun tree. Just watch out for people hunched over, scouring the ground. 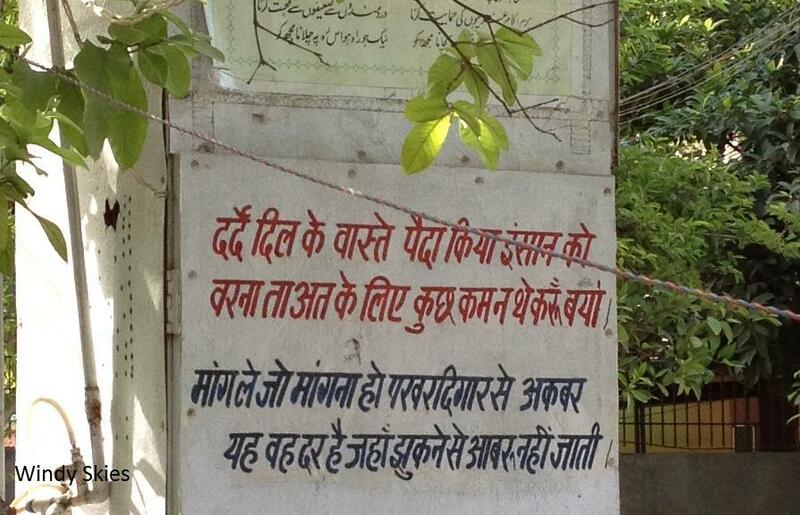 They’re looking for jamuns. It was here Sweetie met the woman who left her smiling. The elderly aunty I met in the park was carrying a walking stick to support her after undergoing a knee surgery. She was a sprightly woman with twinkling eyes that said from a distance: Gapodi aunty – embrace or steer clear of depending upon how much time you’ve on your hands. Bending over to pick jamuns was out of question, but it wasn’t enough to deter her from wanting to sample them. She stopped a passer-by and requested him pick jamuns shed by the tree. The man acquiesced and began to pick the jamuns off the ground. I paused to click pictures of the unfolding scene, and the kindly man spread his palm filled with jamuns he had picked up for the elderly woman so I could photograph them. I was more than happy to make her day. Mere aagey toh solaah saal ki ladki bhi fail hai. I couldn’t help smiling through the remainder of my walk. I couldn’t stop chuckling on my way out. It helps to have unbending knees, for I believe it can sometimes make for an unbending spirit, for life, and maybe beyond. While trees and plants constitute a garden, it takes spirited souls to breathe life into them. Mooh Phat: Blunt-speak, often designed to pinch the other person by way of a taunt. Meetii Churi: Term used to denote a person who’ll sweet talk you while hiding a dagger. Subhchintak: Do-gooder, someone who purports to have your best interests at heart. Meri bhi jamun khatey huey photo khich ley: Photograph me eating jamuns too. Arrey, uski bahu ko bol ki apni jethaani se yeh jagda salatwaley: Hey, tell her daughter-in-law to resolve her conflict with her elder sister-in-law. Mere aagey toh solaa saal ki ladki bhi fail hai. Toh merey hee photo sab khich rahey thay. Even a sixteen year old girl will fade in comparison. And everyone was photographing only me. "In the moment one drinks water, quietude settles about one, lending the moment open for contemplation and aimless gazing as one gulps down the soothing liquid. It’s a moment no one hurries with if they can help it. It’s a moment receptive to philosophy, to matters beyond the immediate." Beautiful writing throughout, Anil, especially this. Thank you for this visit to a public garden and the glimpse of the elderly aunty. She has me smiling, too. Just the other day I was wondering whatever is happening at your end as it had been long since you wrote last. Glad to hear from you. I admit the post was quite long and I didn't have the time to fully read it line by line. Will be back at leisure to read and comment. Do you mind translating the Aunty's comments in English please?! You haven't seen our Mahakali ALM park na so you can concede a point to these dilliwallas. It started in the train and ended up under the jamun tree! Loved it all the way. Did you taste any jamuns? It is one of my favorites. Anil! Have you met @Eye in the sky?! From blog name to the writing style you both have a lot in common. Am: Thank you. It wasn't my visit, but another's (in Italics) that I helped tell here. The elderly aunty is apparently fll of zest for life. NRI Girl: Things have been hectic. Thanks for remembering. I've included a glossary for this very purpose. Hope that helps. The fruiting jamun trees are a constant in the summers. I used to hog handfuls of jamuns laced with salt during my school days. Thank you for your kind comment about the style of posts here. No, haven't 'met' the individual you mention and wasn't sure of the link either. If possible do leave a link behind. Austere: I wish I could say the same. I don't think I've seen it. The 'characters' one encounters are fun, though I wasn't the one who met the 'aunty' featured here.